Photographs by Carol Rosegg courtesy of the Manhattan School of Music. The stunning performance of The Dangerous Liasons currently on stage at the Manhattan School of Music seems ready for prime time. If this was the state of the aristocracy, or one percent, at the time of the French Revolution, deposition was in order. Valmont was sung with flare and bravado by Timothy Murray and his arch rival Madame Merteuil was a wicked delight. They command the proceedings with all the vitriolic and humorous style required. The opera's composer Susa is easy on the ear but never panders. His chamber opera Tranformations based on Anne Sexton's poems is often-performed. The score of Dangerous Liaisons flows through from scene to song to confrontation. Philip Littell's libretto is literate and engaging. Words and music drive the plot forward in tandem. George Manahan leading the MSM Orchestra picks up all the color from the initial drops of rain and claps of thunder to the tender pleadings of the only innocent on stage. The sets by Erhard Rom are simple and apt and suggest opulence. A scrim/curtain, covered with letters, drops down in the front of the stage. Behind it are pillars between which walls move to separate stage space into rooms and woodland walks. 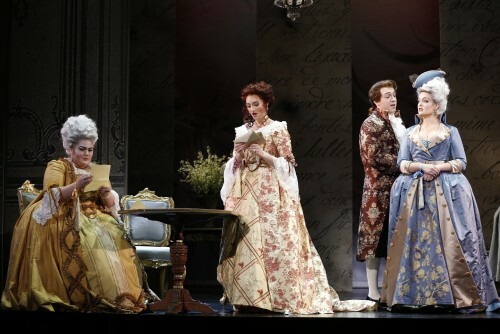 At one point, the nunish Mme Tourvel (Abigail Shapiro) is praying stage right for reprieve from Valmont, Valmont entertains the impish prostitute Emilie while writing letters on her derriere, and Mme. Meurtuel plots and plots. Costumes by Tracy Dorman are elaborately period. The lighting by Tyler Micoleau is used to separate one singer from another, and bathes distinct parts of the stage in soft gold. In the back of all of this is are huge Georgia O'Keefe flowers suggesting, as O'Keefe does, the high octane eroticism of the ongoing plot. Particularly striking was Noragh Devlin whose poignant take on 'love lingering into old age' opens the second act. Perhaps because she is one of the few characters who is neither part of the game to destroy love nor foolish enough to be impacted by it, her embrace of love in rich but clear tones is a delight. Anna Dugan is wicked but charming as Madame Merteuil, the most determined and talented player of the game. We do not know, of course, until the opera's conclusion, that she will dominate. Along the way, as she lofts arias, ensemble singing and recitatives, Dugan subtly makes her case, as revolting as it is. Sosa has written that he uses tonal and atonal music as required. In creating Merteuil, he clearly understands which texture and tones belong where, and how to best deploy them. 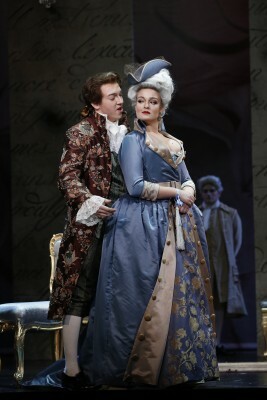 In this take, Valmont is a sweeter version of Don Giovanni. He does not need to wave the thousand name list of female conquests but is rather satisfied to say on a forest walk that there is not a woman he doesn't lust after. He comfortably accepts his attractions without braggadocio. Other characters stand out. The young harp teacher Danceny (Oliver Sewell), who falls for his student Cecile (Janet Todd), already engaged to an older and wealthier man, is also the prey of Madame Merteuil. Sewell's tenor is clear and has a subtle edge which adds to the pleasure of listening. Cecile was sung with charm and brightness by Janet Todd. Production after production at the MSM, Dona Vaughn directing and George Manahan conducting, put on performances of high calibre. Casts and productions are first-rate. MSM shows New York exciting opera for our times. Who can ask for anything more?